Oh hey. Did you know I love cookies? Oh you did? I'm not surprised. It's not a secret. Welcome to #cookieweek my fellow cookie monsters! Susan of The Girl In The Little Red Kitchen and Kim of Cravings of a Lunatic have joined together this week with 23 of their blog friends to present to you a week of cookie treats! We have every type of cookie you can think of listed this week, including something for our furry friends! Now is the time to bookmark these recipes for the upcoming holidays and cookie swaps or simply visit our Pinterest board! 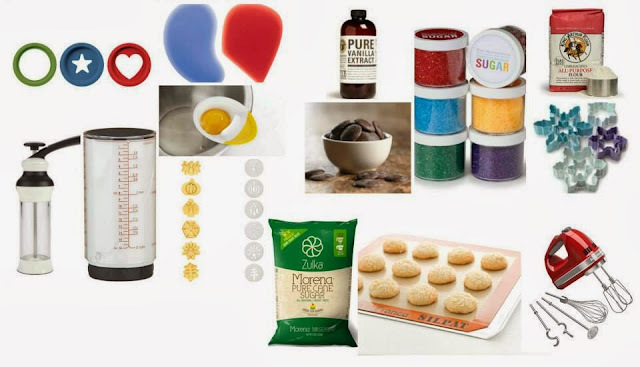 Make sure you enter the giveaway with some fabulous prizes from KitchenAid, King Arthur Flour, OXO, Silpat and Zulka Pure Cane Sugar to help with your cookie making needs! 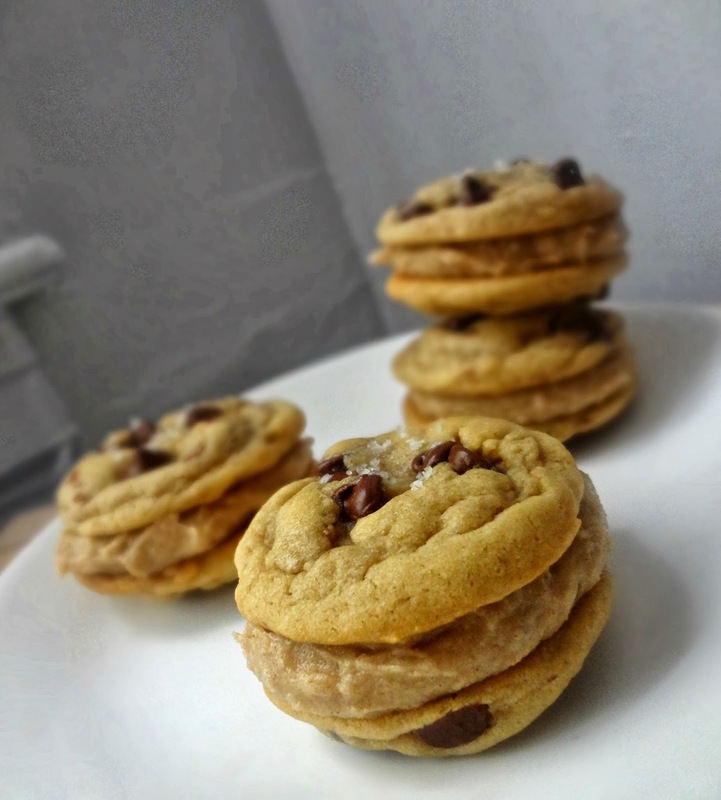 I had to kick off #cookieweek with a cookie OVERLOAD! 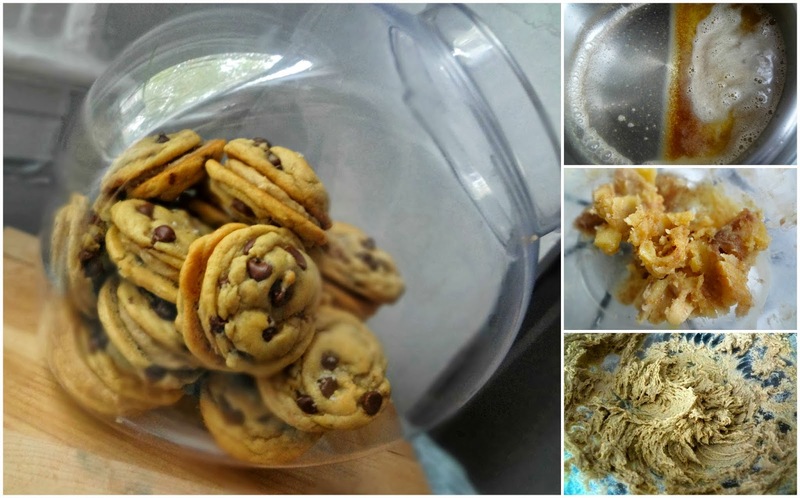 You're pretty much getting 3 cookies in 1: 2 cookies, plus a filling of cookie dough. 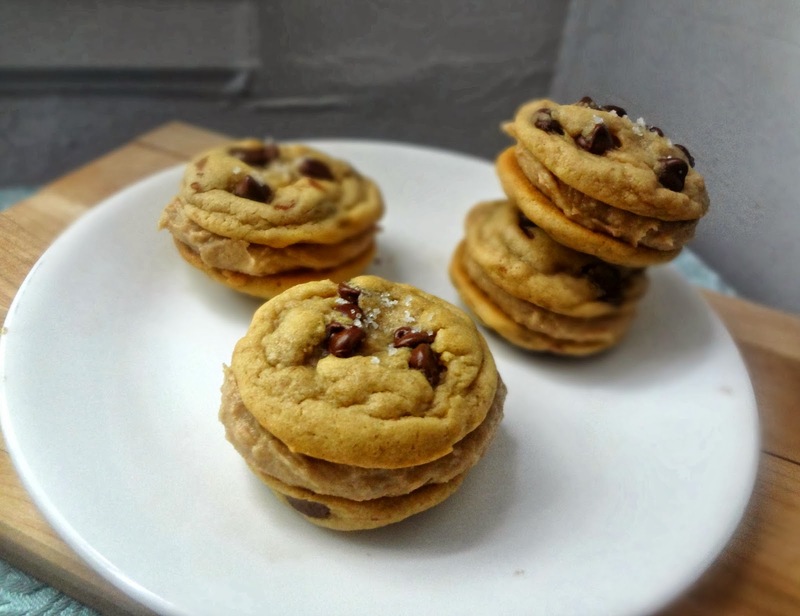 But these aren't just chocolate chip cookies or cookie dough, oh no, they're made with browned butter. And sea salt. AKA 2 of my most favoritest things to do to cookies. Funny fact: these cookies are, in my opinion, best chilled. Which goes against most of my cookie preferences. But for whatever reason, the combo of cookies plus cookie dough just tastes better cold. So, take a bite. A big bite. 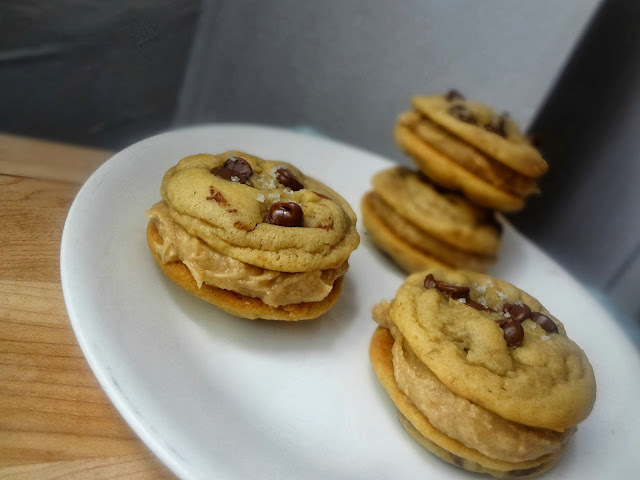 A bite that will cut through delectable cookies, a bite of sea salt, and a creamy, decadent, browned butter (eggless) cookie dough filling. It's like an experience. Possibly a healing one. I mean, I'm not saying these cookies will fix you but...ya know...I'm not saying they won't either. 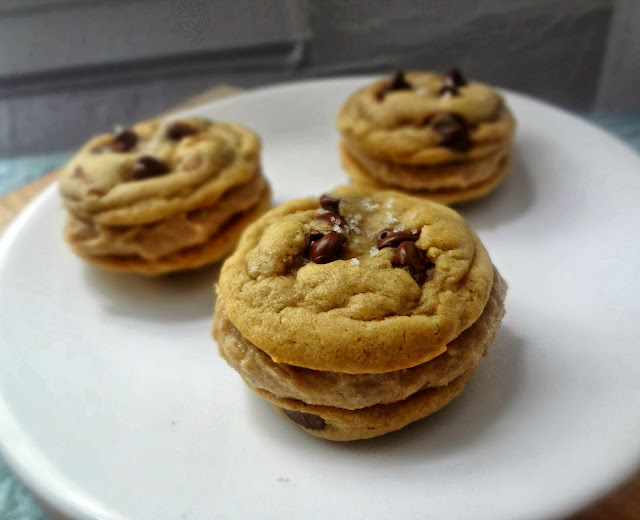 Now, continue on past the recipe for an amazing #cookieweek GIVEAWAY and keep an eye out the rest of this week for more #cookieweek goodness!! Makes about 20 cookie sandwiches. Once ready to scoop, let the chilled dough sit at room temperature for 15 minutes, if needed, to scoop the dough more easily. Scoop out about 2 tbsp., or using a medium cookie scoop, cookie dough balls and place on prepared baking sheet(s), leaving ample space in between. If using, sprinkle sea salt on top of half the dough mounds (there should be about 40 in all). Bake 9-12 minutes, until golden on the outside but slightly undercooked in the middle. Cool on sheet for 5 minutes, then move to a rack to cool completely. How to brown butter: In a (preferably light colored) saucepan, melt butter over medium heat and whisk constantly as it foams and bubbles and eventually brown bits form. Remove from heat and pour into a heatproof bowl. Place in the freezer until it's reached a softened butter consistency-about 25 minutes. Beat together the softened brown butter with the brown sugar until light and fluffy, about 2 minutes. Mix in flour, powdered sugar, and salt. Slowly beat in milk and vanilla until it is fluffy and creamy. Once the cookies are cooled and the brown butter cookie dough is finished, place about 1 tbsp. of dough on an unsalted cookie and top with a salted cookie, pressing until the filling spreads to the edges. Repeat with all the cookies, you should end up with about 20 sandwiches. Can be stored, refrigerated in an airtight container, up to 5 days. Mandatory Entry: Leave a comment with your favorite cookie to bake during the holidays or for cookie swaps. Many more ways to enter in the rafflecopter widget! The iconic Kitchenaid stand mixer was born in 1919, from there stemmed an entire kitchen of high-performance appliances -all created with the same attention to detail and quality.OXO’s mission is dedicated to providing innovative consumer products that make everyday living easier.King Arthur Flour was founded in 1790, as America’s oldest flour company they provided pure, high-quality flour to residents of the newly formed U.S., still going strong, they are the nation’s premier baking resource.Silpat was founded in 1965 by M Guy Demarle in Northern France. He was an experience baker seeing a better way to bake bread with forms using non-stick silicone coatings. He invented the first non-stick baguete baking trays and a few years later invented and created the original Silpat. Zulka Pure Cane Sugar is a Non GMO Project Verified “Morena” sugar - a term used to described granulated sugars that do not undergo conventional refining processes. Zulka is perfect for baking, it tastes better, is less processed and is a cup for cup replacement. Chocolate Peppermint Raisin Cookies from It's Yummi! Disclaimer: KitchenAid, OXO, King Arthur Flour, Silpat and Zulka Pure Cane are providing the prizes free of charge. All opinions stated are my own. This post contains Affiliate links.